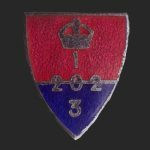 The Group was commanded by Lt Frank Byass, a local Bainton farmer, Frank was the original Leader of the Patrol and was born in 1914. To the North East was RAF Driffield, just less than 3 miles from the Airfield where a number of Bomber Command Squadrons flew from. To the South East was RAF Leconfield although almost 8 miles away was said to have been a Training Target of the Unit. Leconfield was home to Bomber command Squadrons and for a short time Fighter Squadrons. Also South East of the Unit was RAF Hutton Cranswick a lot nearer than Leconfield and was used by Fighter Squadrons. The collapsed Main Chamber had two side brick built end walls. The size of the OB approx 15 feet long and 9 feet wide. The escape tunnel has collapsed, as is the entry shaft which may have been wood line as no brickwork was seen. Typical of a lot of East Yorkshire OB’s this one was built just 6 feet from a public footpath. We also found that the depth of the OB was very shallow with only around a foot of earth to cover the entire structure. The escape tunnel long since gone exited the OB and ran to the edge of the woodland. I estimate that from the Entry shaft to the Escape exit was only around 40 feet. The Unit was just over 3 miles from the Middleton on the Wolds County HQ and training ground so it would be safe to assume that they trained there. Although listed in the Patrol targets are airfields it is thought that they were to watch the important cross roads of the A614 and B1248. We checked this within the OP location and at no time could the crossroads be observed or from any location in the tree line. We came across a structure that had been brick built and a large depression was evident in the ground. Alan Williamson in his book “East Ridings Secret Resistance 2004” states that the Explosive Store was Stanton Type Shelter built, we could find no evidence for concrete sections but did find a lot of bricks with mortar in the same style as the OB bricks. I can only surmise that this is the Explosive Store recorded and that the concrete sections that are heavily involved in the construction process of a Stanton type shelter were either blown apart and destroyed or moved off site or are covered by woodland debris and the heavy moss that covers the area. We could not find any reason for the abundance of brickwork and the depression.